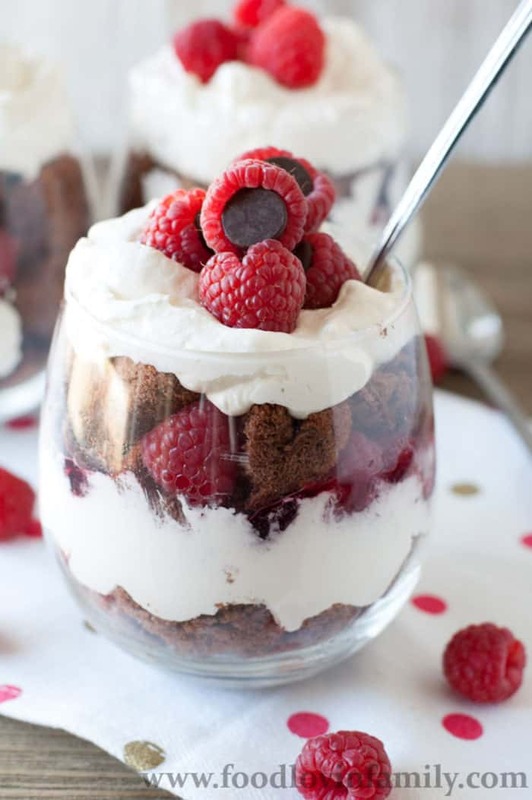 This Chocolate Angel Food Cake Raspberry Trifle is a simple and beautiful dessert that is sure to wow! Hi everyone, my name is Heather and I am here from Food Lovin’ Family. This is my first post on The Melrose Family and I am excited to share some delicious recipes with you this year. Today I want to talk trifles. They are one of my favorite desserts to make because they are easy, tasty and beautiful. Everyone always thinks that they take a lot of time to assemble but they are really simple to make. 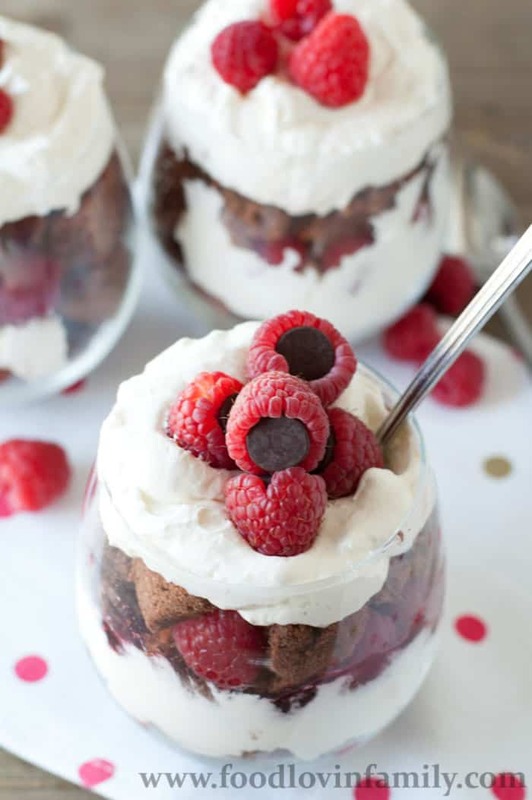 This chocolate angel food raspberry trifle is one of my very favorites. The combination of chocolate and raspberry is incredible. 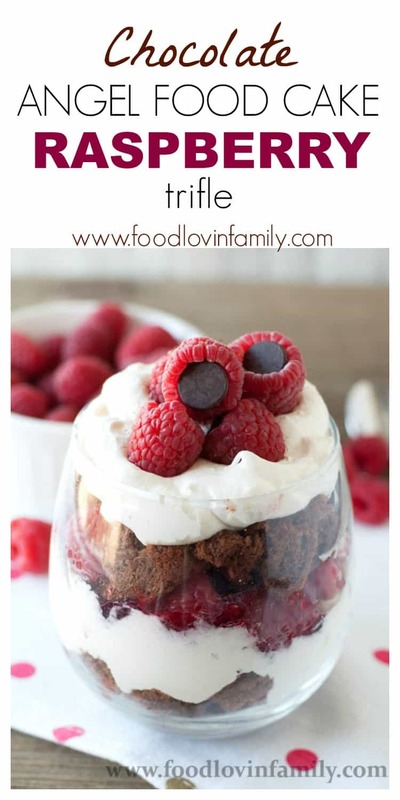 Last year I made this trifle for my husband and I on Valentine’s Day and it was a HUGE hit! We were licking the bowl clean. To make this trifle I begin with chocolate angel food cake. I used a simple angel food cake mix and then added 1/2 cup of cocoa powder to the mix to make it chocolate. The cream filling is a mixture of sugar, cream cheese and frozen whipped topping. Start by putting a layer of cubed chocolate angel food cake on the bottom of the bowl then add a layer of cream. Next I spoon on a light layer of raspberry preserves and then fresh raspberries. Keep layering until you reach the top. I was able to get two layers in my individual cups. You can put this trifle in a trifle bowl or if you are like me and don’t like to share, use a cup or mason jar for individual portions. To make this dessert extra special and chocolaty, I stuffed the top raspberries with dark chocolate chips. For more tasty trifles be sure to check out BLUEBERRY TRIFLE , RED VELVET TRIFLE and MASON JAR CAKES. 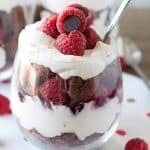 This Chocolate Angel Food Cake Raspberry Trifle is a simple and beautiful dessert that is sure to wow! Spoil your sweetheart with one this Valentine's Day! Prepare angel food cake according to the box directions making sure to add 1/2 cup cocoa powder to the cake mix. Using a mixer, mix together cream cheese, sugar and frozen whipped topping until well blended. 4-5 minutes. Once angel food cake has cooled, cut into small 1 inch chunks or cubes. Start the layers by adding a layer of cake cubes to the bottom of trifle bowl. Spoon 1/3 of the cream mixture on cake. Drizzle 1/4 cup of raspberry preserves over cream. Next place 1/2 of the raspberries on the preserves. Repeat the layers: cake, cream, raspberry preserves and raspberries. Finish the top with cream and chocolate chip stuffed raspberries. Heather shares easy family recipes on her blog, Food Lovin’ Family. Wow…this looks amazing! I’m pretty sure I’d be licking the bowl clean too, if I could get to it before my 4 year old did!